OK, so you get a little distracted. I was listening this weekend to a friend in his 60’s talk about ADD, as if this were something he discovered recently. If you study brain profiles, like I have for all the years I have done healing work on the brain, you will discover that most people have some sort of learning or focus challenge. I have yet to meet the person with the perfect brain. Even the people with genius brain profiles have challenges because they have to learn how to be patient with all the rest of us, who don’t get everything right just this now like they do. They have to work on their emotional intelligence, which requires patience, empathy and compassion. 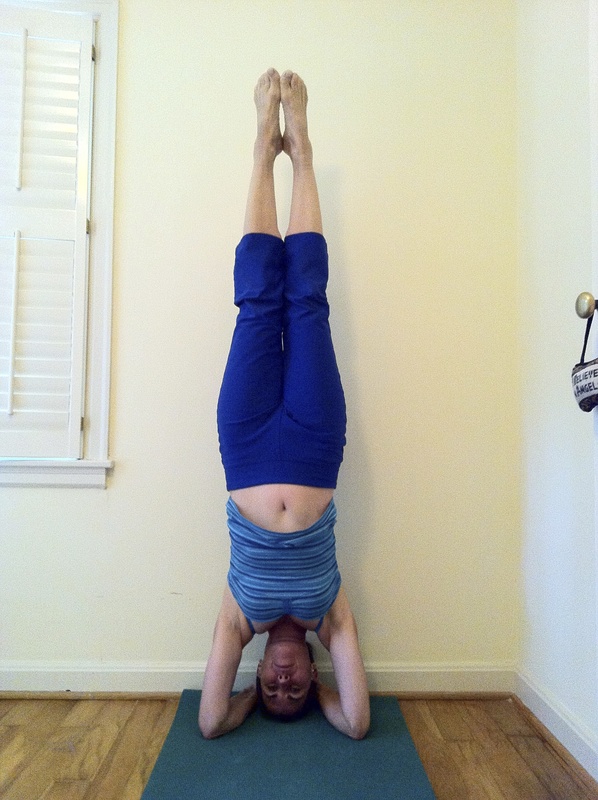 So here is my point about headstand. You can’t think about anything else while you are doing it. You are pretty much in the now. Trained an exercise client. Ate breakfast. Walked the dog. Fini Shell and her associate Beau arrived early to help me with my chores. I stood on my head, and then Fini and I cleaned out the wine cellar of my house while Beau went outside to chop wood. She and I removed every item in the wine cellar so that it can be cleaned from top to bottom. Let me add – for those of you who are wondering – that I am not a big consumer of alcohol, it’s just that my house had a wine cellar when I bought it 11 years ago and that’s what I have used as my storage room. I met a service technician to talk about removing bats that have gotten in the siding on the front of my house. I met a client. Took a shower. Called about organic cleaning products and – oh my gosh – I realized I was late for my 11 a.m. yoga class! Realized I wasn’t breathing properly as I rushed to yoga in my car. When I arrived a few minutes late to my yoga class, I pointed out to the ladies present that no man would have multitasked the way I did this morning. But in the moment I was standing on my head I wasn’t thinking about all the things I had to do today. I was in the now.